For those times you are planning a gathering and you know your house or venue is going to be packed, so it will most definitely be standing room only. For these occasions, we recommend your menu is planned to suit. When it comes to this type of dining, we’ve got you covered. Whether you are looking for a traditional buffet or something a bit trendier, there is a menu to suit. Whatever you require, the Sussex Chef team are here to help you every step of the way. 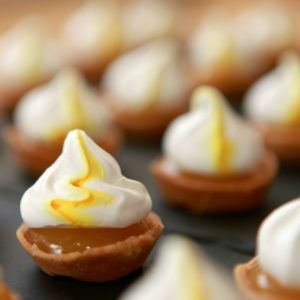 Take a look at our ‘eat on your feet’ menus to ensure you get your party catering perfect. When it comes to fun, tasty, colourful food, bowl food is where it’s at. 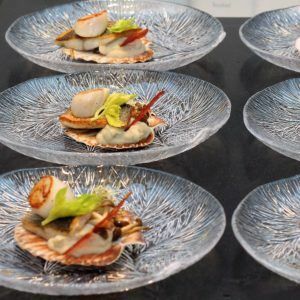 You will be able to revel in delight as a splendid display of dishes are laid out before your guests, all in little bowls so that your guests can enjoy a few different dishes over the course of your event. You can have a starter bowl, followed by a main course and of course dessert! Finger buffets are a great way to feed your guests. 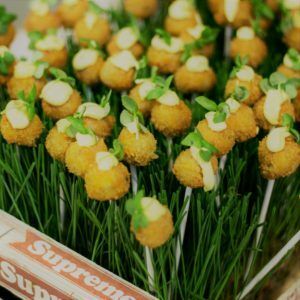 Lay on a finger buffet that will get people excited and chatting amongst themselves and complimenting you on what a wonderful buffet you have laid out for them. We have wonderful menus for you to choose from, you can even ask us to make some of your favourite dishes even if they are not already on the menu. Afternoon teas are possibly what Sussex Chef are best known for! Our afternoon teas are created by a skilled team of chefs with decades of culinary experience that result in the finest afternoon tea you will ever lay eyes on! And, they taste as delightful as they look! Sussex Chef’s aim is that your afternoon tea will be talked about for the months to come for all the right reasons.